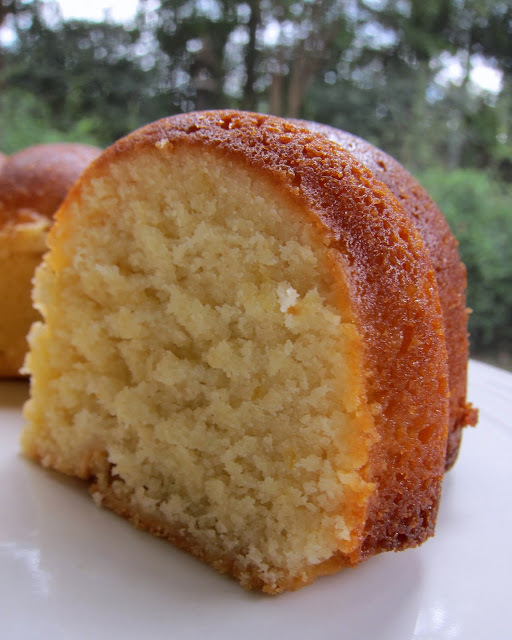 The Ritz Carlton Lemon Pound Cake - the only from scratch Lemon Pound Cake recipe you will ever need! It tastes amazing! This recipe never lets me down. Great dessert for a crowd. Serve with vanilla ice cream and fresh fruit. This recipe is from the Ritz Carlton Cooking School I went to back in August. I've been working my way through some of my favorite dishes at home, and this lemon pound cake was the first recipe I attempted. I loved the cake when we had it at cooking school, and I wanted to share it with Chicken Legs. The cake turned out fantastic! It tasted just like it did at cooking school. It had a great lemon flavor without being overwhelming. This is going to be my "go-to" pound cake from now on. We served it with a big scoop of Blue Bell Homemade Vanilla ice cream. Perfection! Preheat oven to 350ºF. Spray or butter and flour 2 loaf pans or one large Bundt pan. Sift flour, baking powder and salt into medium bowl. Set aside. Using an electric mixer, cream together butter, shortening and sugar. Add eggs one at a time, beating until well blended after each one. Add dry ingredients in three additions to butter mixture alternately with milk, beginning and ending with flour mixture. Beat at low speed just until blended after each addition. Mix in lemon juice and zest. Pour batter into prepared pans. Bake cakes until tester inserted into center comes out clean, about 55 minutes. Cool cakes in pans for 15 minutes. Turn cakes out onto racks and cool completely. Your cake looks perfect! Looks so moist and delicious! I love lemon pound cakes! Have a nice day! That looks like simple elegance! I can't wait to try the recipe. Thanks Steph! Yum, yum, yum...I keep hearing about Blue Bell icecream but we can't get it in Canada. That cake looks brilliant. It is a gift from the milk gods. ..lol. Born and raised TX girl here! No self respecting baker this side of the Rio Grande would be caught without it. Check with some of your local restaurants. We had to do that when we moved to Virginia for 5 years. One of the burger franchises used Blue Bell and they said we could buy it through them. Limits your flavor selection, but Homemade Vanilla is my favorite anyways. I could be a little bias, but I think its the best ice cream that I've ever had. I used this recipe and added a pint of fresh blueberries. I tossed them in flour first and shook off the excess...folded them in with a rubber spatula. I baked the cake in an old 2-piece angel food cake and it took about 1 hour and 15 minutes in a 350F oven. Looks great and a little sample from the small amount that stuck to the pan was delicious. I hope it's all good when I cut into it for my wife's birthday Friday. (I find that pound cake is better a couple days later...I'm keeping it wrapped in the fridge.) I also made a drizzle from a cup of powdered sugar, a cup of blueberries, and a chunk of cream cheese...maybe 3 tablespoons. Blended with a handheld blender. That will go on at the last minute. Thanks for the recipe! The lemon flavor is really bright, too. Looks Delicious! I'm going to link this up to Gameday Style...I have the perfect Football Stadium cake pan to bake this in! You are going to make me break down and have to cook one. Gameday Style - I have that same pan - it is so much fun for gameday! This looks amazing and I will be making it this weekend. I am so glad to have found you. I've been cooking my head off ever since I made your Cheddar bread...sooo good...and then, tonight, I made the 7up biscuits..they were so light and fluffy, they nearly flew off my plate. I made the Coke cake and it was delicious. Sooo, thanks a bunch for sharing your talent of cooking and your good recipes with us. BJ - I'm so glad you've enjoyed the recipes! 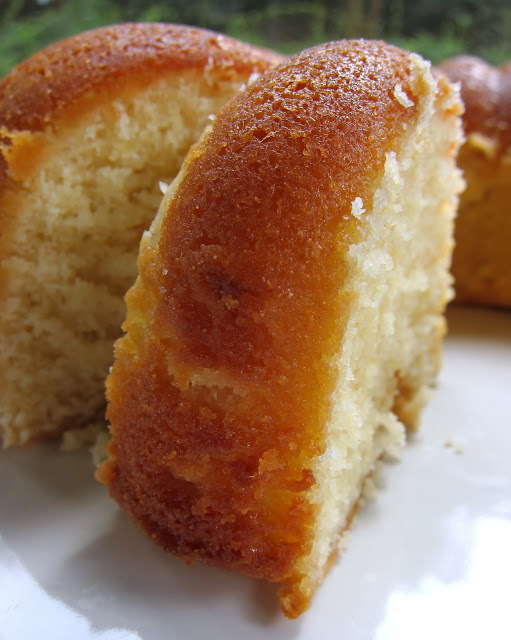 This pound cake is really good - I hope you enjoy it as well! wow, the texture looks like everything i would want in a pound cake. i imagine this would taste fabulous. what's the difference between shortening and butter? A friend and I just had a great lemon cake when we were out to lunch last week and I decided I had to find a good recipe to try. This is definately going to the top of my list! Thanks for sharing. Elizabeth - solid vegetable shortening aka Crisco. Many prefer pie crusts that are a combo of butter and shortening. I was wondering myself if I could go all butter but will try it first as written. Hi. What size is your bunt pan? I made this and it ran over all in my oven. It was a disaster. The batter was amazing so I know the cake was going t be great! My pan is a ten cup I think. Thanks! I make it in a 12 or 10 cup bundt pan. I have some leftover batter if I use the 10 cup. OMG my Grandma Ella made a lemon pound cake to die for! I am definately going to try this recipe. I was wondering what type of frosting you would recommend? And if you do recommend, could you add the recipe? This pound cake has the BEST taste, but I had an EPIC fail with it. The sides pulled away from my loaf pan and caved into the middle and the bottom fourth would not come out ... I had to ladle it out. And, yes, I did prepare the pan. I don't know what I did wrong, but will definitely try the cake again. Any ideas as to what I did? I was taking it to a lunch today but decided to go back to my old faithful recipe on my redo. I use a bundt pan and I've never had any issues with it. I just made it for Easter and it was perfect. I followed the recipe and directions as written. Try it again. I used a 10" and before I read the blog it started to over flow, caught it early and scooped some out and put into a loaf pan. It turned out pretty good after that. Next time Im going to try two 10" bundt cakes pans. It's in the oven--can't wait! I didn't have enough lemon juice so I put in some lemon curd... will see. It looks absolutely delicious, but I'm wondering what shortening is. I'm in the UK and we don't have anything called that! Is all purpose flour our plain flour (as opposed to self raising). I can't wait to try this - it just looks wonderful! It is a solid fat made from vegetable oils. Can be under the names Trex, Flora White or Cookeen. Plain flour is all purpose flour. PhDer - all purpose flour is regular flour (not self-rising). You can use butter if you can't find a substitute for shortening. The brand name here is Crisco. You might look for a solid vegetable fat product. Ahhh, I see, thank you for that! We don't have Crisco but I think that maybe our white vegetable fats (hard to get hold of) will be much the same - I'll go hunting. For now, until I can find some I'll try it out with butter. I have a similar recipe but I top with one cup of powdered sugar mixed with the juice and zest of one lemon. Anyone ever used Splenda instead of Sugar?? "Vegetable shortening is a white, solid fat made from vegetable oils. In the UK it is sold under the brand names Trex, Flora White or Cookeen. In the US Crisco is the best known and there is also an organic solid vegetable shortening made by Earth Balance. In Australia the best known brand is Copha." I tried this and also had an epic fail. The cake looked and tested done. I took it out of the oven and let it cool for a few minutes. Then I started making a lemon glaze that is delicious... 1 stick of butter, 1 1/2 c powdered sugar, 2T lemon juice warmed in a pan on the stove. When I dumped the cake onto the cooling rack it just felt funny. Half came out, half stayed in...the bottom half was gooey. I found a good-sized bowl and put it in, added the glaze, mixed it all up together and took it and some whipped cream to a potluck where everyone raved about it! I called it Lemon Casserole. Hope I can do it again! @Amy, I busted out laughing at your Lemon Casserole! As the old saying goes when life gives you lemons make Lemon Casserole! Love It..lol!!! My whole family partook in the festivities of making this lemon pound cake two days ago! I have to say ours came out absolutely perfect! We did everything exactly as you said and I have to say we were amazed at how well we did! The pound cake is as good as it looks in the picture. The only thing we were missing was the lemon glaze. Thank you Amy for the recipe for the lemon glaze we will be using this on the next one! Oh yes, there is going to be a next one! Pound cake and Blue Bell, there isn't anything else better in this world. Thanks for sharing your recipe. I tried this yesterday and it turned out pretty darn good for my first cake from scratch. I didn't have shortening so I substituted with Country Crock spread (next time I’ll probably use all butter). My cake seemed to cook a little too fast on the top so I’ll reduce my temperature some. After the suggested cooking time and tooth pick test, I turned the oven off and let it sit in another 10 minutes to let the bottom continue to cook. I also did a glaze with confection sugar and lemon juice which was a little sweet for me so next time I’ll also add butter and do it on the stove as Amy suggested. Thanks for sharing this recipe! Thanks for the recipe! My first time making a pound cake. The batter was so...soft, I thought I might not have measured in enough flour! But the cake came out just like the picture and it was DELICIOUS! Moist and yet sort of dense in that poundcake way! I topped it with a lemon glaze (2 cups of powdered sugar with a couple of tablespoons of lemon juice). Loved it! It's a keeper. Thanks again! Does the milk need to be whole or will reduced fat 2% work? I baked the cake this morning for my Canasta card group. Mine needed an extra 10 minutes in the oven, and an extra 5 after I turned the oven off. Made a glaze with 11/2 cup sugar, 1/2 cup butter, 2 Tbl lemon juice, 1 Tbl lemon zest, cooked. Poked holes in the cake while warm. Poured the glaze over the cake. Teacher Lori - sorry your cake fell. I've never had any issues with the cake falling. Angie - the cooking time worked for me in my oven. Feel free to play around with the baking time. My loaf pans needed close to an hour to bake. Expired Baking Powder or opening the oven too much and exposing to cake to inconsistent temperatures before it's finished. Keep it in the back of the oven, don't move it around too much and try to keep the oven shut. I would like to make a small cake (cause i'm the one who like lemon) ; dividing the portions by 2, would you recommend 2 or 3 eggs ? And so, more or less milk to equilibrate the liquid in the cake (or not) ? this looks so good I want to eat the picture! can't want to try. Just took my cake out of the oven. Perfect!! I have made this recipe twice now. Once using loaf pans and second with a bundt pan. It was delicious! I also used the icing recipe that was posted in the comments. Thanks for sharing this recipe! Thanks for the recipe. I will try this tomorrow. One quick question. Do I measure the 3 cups of AP flour before sifting or measure 3 cups after sifting? Thanks! Can you use vanilla instead of the lemon? I'm making this for dessert tonight. It's in the oven right now & smells delicious! My boyfriend really wants Poppyseed lemon Pound Cake. Think I could get away with just adding a couple Tablespoons to the recipe as is? This could not have turned out more wrong for me. I was SO excited and even grated a lemon. I mean, I grated a lemon! The sides overflowed, stuck to the pan and the middle fell so it looked like something out of a bad dream. The outside parts got hard and chewy and the entire cake was as heavy as cornbread. A tear leaked out of my eye. The flavor WAS good, but I was so creeped out by the rest of it that I only had like 3 or 12 bites before I threw the whole thing away! Samantha - I am so sorry to hear the cake didn't work out for you! I wish I could come over and make it with you. I used a pampered chef bundt pan - my cakes never stick to it. I had a little leftover batter with that pan - make sure you don't fill the cake pan all the way to the top. Leave some room for it to rise. Can I use cake flour instead of all purpose? Mine is in the oven now and smells so good. We are having it tomorrow night for dessert at my mom's house! can you substitute shortening in this recipe with something else? if so, what measurement should that be? Shruti - I've never changed up the recipe. You could try substituting butter, but I can't guarantee it will turn out. I made this and it was wonderful! I just didn't use all the batter for the bundt cake version. It also didn't take as long to cook. So don't fill it up, and keep an eye on it. It will be worth it! It disappeared in my house, with picky eaters. Just made this pound cake. The texture is great . Also it taste pretty good. Only issue was that after I turned it over to flip to cool the top part of my cake stuck to the pan. I've baked a lot of pound cakes and this is the first time this has ever happened to me. Thank goodness there wasn't a lot that got stuck inside my budnt pan. Next time I will spray my pan more heavily. Thanks for sharing your recipe. Looks and sounds like a cake I'd like to try. I have made lemon cheesecake but never pound cake. Thanks for sharing! Made this last night, and oh my goodness!!! I'm not crazy about lemon, and didn't have unsalted butter, so used regular butter, butter flavored shortening, 2% milk, the juice of 2 Navel oranges, and the grated rind from both. I greased the pan with shortening, then floured. Baked it for the allotted time and it slid right out of the pan. After it cooled, I mixed more orange juice with confectioner's sugar, and drizzled it over the top. It was one of the moistest made from scratch cakes I have ever made. I will definitely make this again....soon! I was so thrilled to try this recipe for my Moms birthday. She loves lemon pound cake. I baked my cake in a 10 in springform cake - 3 inches high. Baking at 350 for 55 minutes was no where near long enough. So much batter dripped over the sides of my pan - it should have been enough for 10-12 cups. After an hour it was still dripping - what am I doing wrong? 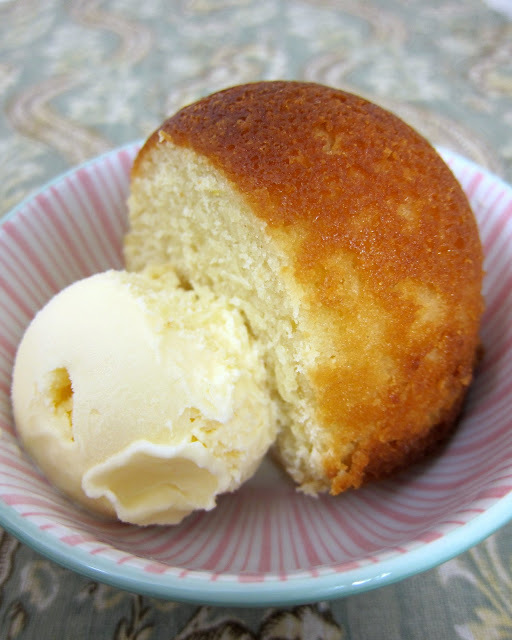 Kitrin - I have never tried this recipe in a springform pan. It would take longer to cook since there isn't a hole in the middle. Also, when you fill the pan make sure to leave room for the cake to rise. You never want to fill a cake pan to the top. I usually leave at least an inch to an inch and a half at the top of the pan. Thanks Stephanie. I should have done a trial run before I needed to do my "good" cake, but we live and learn, right? Saw this recipe and it looked so good that I made the batter and put it in the oven before I read all the comments. I got worried since so many people had problems with the cake not baking properly. I used a 12 cup bundt pan, buttered & floured. Baked it for 50 minutes, then checked it. The cake tester came out wet but the outside looked done si I reduced the oven to 325 and let it bake for 10 more minutes then turned the oven off and let it sit for another 5. Cake tester came out clean this time. Let it cool on a rack for about 15 minutes, ran a knife around the pan edges and the cake slid right out, no problem! I made this for a March of Dimes bake sale...I think it's going to be a hit! The first time, I used all the batter in my 12-cup bundt pan and it overflowed like crazy. Caught fire in my oven and made a horrible mess. It was a disaster! But the batter tasted so good, I had to try it again. I made it again tonight and left about 2 inches of room in the bundt pan. Otherwise, I followed the directions exactly and wow - it's delicious! I made the lemon glaze that was suggested in the comments and it makes the cake even better. I also think the cake would be great toasted and with a side of ice cream! Thanks for the recipe, it's a keeper! This cake recipe is delicious! My husband loves it and he's not a 'sweets' kind of person. Will be making this again. I poured it into two loaf pans, and after only about 20 minutes in the oven the top started to burn and it started spilling over everywhere. After 30 minutes the middle started collapsing. With about 10 minutes left the top was getting too dark around the edges and it was spilling out everywhere, so I took it out. It was done by then, and tasted great, but was a mess.Anyone know why this happened? Maya - it sounds like you overfilled the pans. Make sure to leave at least 1 inch in the pan so the cake can rise. Made this after reading the comments. It was yummy! I used coconut oil to replace the shortening. I made it in loaf pans and after 30 minutes I loosely covered with foil to keep from darkening too much. I wished I had put wax paper in the pans because mine stuck to the bottom and wouldn't come out. But, a good recipe. Thanks! I don't have all purpose flour, only self -rising. Will that work? I love this recipe! I made it several times for my small group, and it's always a big hit! Thanks for sharing such a gem! You should leave about an inch at the top of the bundt pan so the cake has space to rise. There could be some leftover batter. Made this today and followed the recipe exactly. Halved the quantities and used a loaf pan. Absolutely perfect result and delicious!! Thank you. This cake does indeed look divine but I am concerned about the use of trans fat in the recipe in the form of shortening. . Is there an alternative other than additional butter ? I used Crisco and it is trans fat free per the product and their website. It looks scrumptious but it is a pitty that the recipe is in USA measurements. Does anyone have it in European measurements like grams? And what is shortening? According to documentation, Trex, or White Flora (found in large Tesco or ASDA supermarkets) would be the European alternative for Crisco. Just wondering if I could use cake flour instead of all-purpose? I've never used all-purpose flour in my cakes. You can't substitute cake flour for regular AP flour. They are not equal substitutions. You would have to reformulate the recipe. Let me know if you try it. Fantastic cake. Very moist and flavorful. Thanks for sharing. Do you have to use whole milk? the best thing about this cake is that it needs no embellishments, cut your slice, pick it up and eat it, no dish, no fork needed. Loved your recipe.it turned out super yum.thank you. Going to try this tomorrow! Dumb question, it calls for 3 cups of flour. Is it 3 cups of unsifted flour, then sift, or 3 cups of sifted flour? Also, will cutting back on the sugar to 2 cups, affect the turnout? I don't use regular milk. Would almond milk work also? I've never cooked or baked with almond milk. If you've used it in other recipes with success, I'm sure it would be fine. I have made this cake many times and it's a big favourite amongst my family and friends . I thank you so much for sharing it . I made this cake yesterday and it turned out well. Very moist and the lemon flavor is outstanding. I used a 10 cup Bundt pan and added 10 minutes of cooking time. This cake is so good, I can see using it for special occasions . I've been looking at lemon recipes a lot lately. I had some lemon bread and it kicked the craving up even more. This recipe looks awesome and I can't wait to try it. I lived in Texas for quite a number of years, but returned to my home in PA. Thanks for reminding me about Blue Bell Vanilla Ice Cream-My absolute favorite! I had forgotten about it. Now I want some, especially with this cake! How long does it take to bake in a 13/9 cake pan? wonderful recipe! so easy to make and absolutely delicious. i made it for father's day and it was a hit. i was using it for strawberry shortcake, so i left out the lemon and added some vanilla. my only problem was i think my baking powder is too old and the cakes sunk in the middle. still tasted great though, so nobody cared.